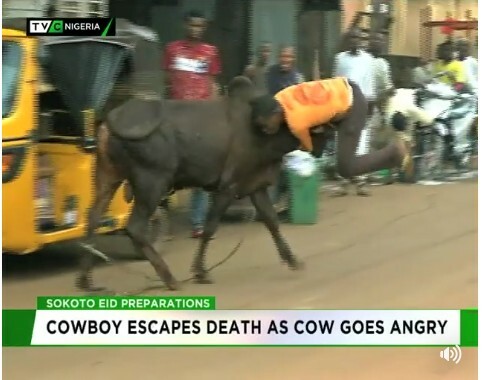 A cowboy was very fortunate to escape death after being attacked by an angry cow in Sokoto just before the Eid celebration. An incident resembling a matador taking on a bull occurred in the state when the cowboy met an ill-tempered cow as he was trying to lead and tame the cow, the cow went berserk and attacked trying to gore him with its horns. But the cowboy struggled to protect himself, narrowly missing being knocked down by the massive animal. It could have been a normal way of taking the bull by the horns; instead, it is the cow taking the man in between its horns. 0 Response to "Cowboy Escapes Death After Being Attacked By Angry Cow In Sokoto "